Music is a natural and important part of a young child’s growth and development. “Early experiences with music provide the foundation upon which future music learning and appreciation are built,” says Daria Webber, director of the Bernice M. Wright (BMW) Child Development Laboratory School in Falk College’s Department of Child & Family Studies. Music is a natural and important part of a young child’s growth and development. 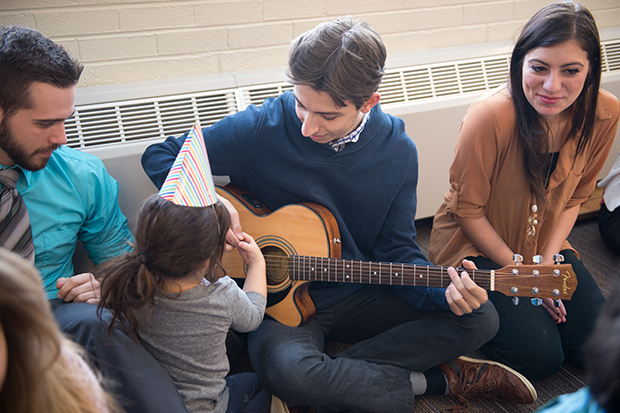 Consequently, developmentally appropriate programs in early childhood settings that incorporate singing, moving, listening, creating and playing instruments offer an important individual form of self-expression. 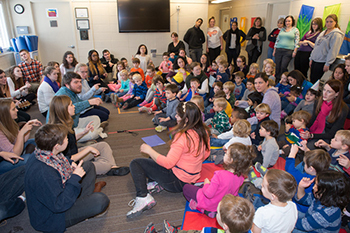 An ongoing creative collaboration involving BMW teachers and music education faculty members in the College of Visual and Performing Arts’ (VPA) Rose, Jules R. and Stanford S. Setnor School of Music, in conjunction with the School of Education, recently connected college-aged and preschool students for a unique and valuable learning experience. During the Fall 2014 semester, Juliet Hess, assistant professor of music education, working with Webber, brought sophomore students enrolled in the “Foundations of Music Education” class to South Campus to enhance an already-existing music program provided in BMW classrooms. “While sophomore students have the opportunity to observe classes in school settings, the collaboration with Bernice Wright afforded them their first formal opportunity to teach,” notes Hess. Music students spent time with the preschool-aged children on Friday mornings, alternating between small-group activities in individual classrooms, and whole-group presentations to all of the children gathered together. Some of the activities included songs and finger plays, creative movement and instrument demonstrations and experiences. The program concluded with an “All School Sing,” which featured the work of the BMW and VPA students. Musical experiences with preschoolers take place in both large and small groups, and individually. “Musical experiences in early childhood classrooms need to be play based, as is true in all areas of our curriculum,” says Webber. The VPA students varied the types of learning opportunities, such as one-on-one, free choice, large group and small group, which provided many varied and valuable learning experiences for all students of all ages. “We are thrilled to take advantage of being part of a University community that allows us to collaborate across disciplines. We have been fortunate to have several families enrolled here at BMW over the years who are musicians and music educators, who assist us in making these connections, namely Dr. Elisa Dekaney, associate professor of music in the Setnor School. It was in 2010 when we first started this collaboration, and we are looking forward to continuing this relationship for years to come,” says Webber.